Without realizing it, I had unofficially taken on another career. I was becoming a Stuff Manager. Over the years, I've furnished our home mainly through second-hand finds and a few dollars in my pocket. I've found chairs for our tables, dishes to eat from and wall art to hang. I loved hunting for bargains and finding things we could use that also made our house feel welcoming and cozy. This served us well when our family was young, and we truly needed a chair next to the table. But I ignored the warning signs that our little house was filling up with bargain-bought stuff. Look through stuff, put away stuff, organize stuff, feel guilty because I haven't organized other stuff, fuss at my kids about their stuff, wade through misplaced stuff in our garage, pile up stuff on the table, pack away stuff and move around stuff. Ask my husband where he put his stuff, and sort, wash and dry other stuff. Then, I would dream about more stuff that I wanted and the bigger house I "needed" so it could hold more stuff because I thought our house was too small. I never planned on spending so much time managing stuff; it just kind of happened. Over time, my collection of stuff made my life difficult, all in the name of trying to create a pretty, functional, cozy and inviting home. I thought a bunch of stuff was what made a home and defined my style. Instead, it was all getting in my way. I was afraid to let go of things because I didn’t trust I would have what I needed in the future. I was ignoring the still small voice that was whispering the word, Enough. Enough doesn't mean everything is perfect; it simply means we have enough because we’ve met a goal. 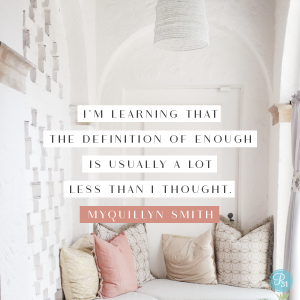 Whether that’s in our home, our closet, on our dinner plate or our schedule, we get to say, "That's enough." We don't say we have enough because we don't know how to get more; we say "enough" because we don't want or need more. We’ve decided to end the quest for more because there's something we want more than more. I used to view every empty space on a wall, every empty hanger, every inch on my plate as an unfinished thing or an empty space that needed filling. I thought it was my job to fill it. I now see empty space as a gift. Having white space or margin in my home, schedule and walls is just as important as having margin in my life. Once I realized I had enough, I was free to see places in my life where I had extra, and then, something amazing happened. I wanted to share it. This is what happens when you finally realize you've had enough all along: You are free to give the rest away. Letting go of the extra chair or clothes I don’t need, or opening up our home and space to others, has been an act of trust and a gift to others and to myself. I’m learning to trust that if God provided something good now, He’ll provide it again in the future if it’s what we truly need. I’m free to part with my extras, and I’m learning that the definition of enough is usually a lot less than I thought. Dear God, help me recognize where I already have enough. Change my definition of enough, and show me where to share my extra. In Jesus’ Name, Amen. Do you long for your home to be an inviting place of peace, rest, hospitably and meaningful beauty? Cozy Minimalist Home: More Style, Less Stuff by Myquillyn Smith will help you get your home looking the way you’ve always wanted so you can finally use it the way you’ve always dreamed. 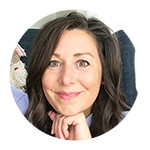 Find daily encouragement for imperfect, loved-on and lived-in homes when you follow @TheNester on Instagram, and at her website, Nesting Place. What abundance in your home today is waiting to be shared? From inviting a friend for coffee and a chat, to passing down unused items in your house to your neighbor, who could benefit from something you have more than enough of in your home? © 2018 by Myquillyn Smith. All rights reserved. Proverbs 31 Ministries thanks Zondervan for their sponsorship of today's devotion.